The results, published in the journal Physical Review Letters, should significantly impact not only the study of black holes, but also the search for elusive gravitational waves – a type of radiation predicted by Einstein's theory of general relativity – in the cosmos. "An accelerating charge, like an electron, produces electromagnetic radiation, including visible light waves," said Dr Michael Kesden of the University of Texas at Dallas, the paper's lead author. "Similarly, any time you have an accelerating mass, you can produce gravitational waves." Illustration of two rotating black holes in orbit. 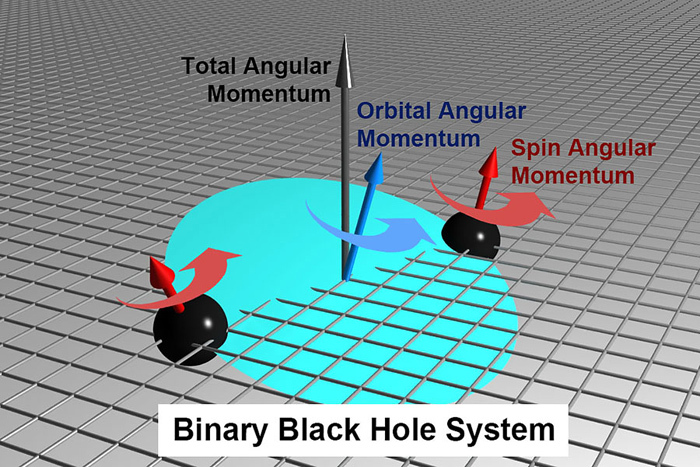 Both, the black hole spins (red arrows) and the orbital angular momentum (blue arrow), precess about the total angular momentum (grey arrow) in a manner that characterizes the black-hole binary system. Gravitational waves carry away energy and momentum from the system and the orbital plane (light blue) tilts and turns accordingly. Graphic by Midori Kitagawa. While Einstein's theories predict the existence of gravitational waves, they have not been directly detected. But the ability to 'see' gravitational waves would open up a new window to view and study the universe. 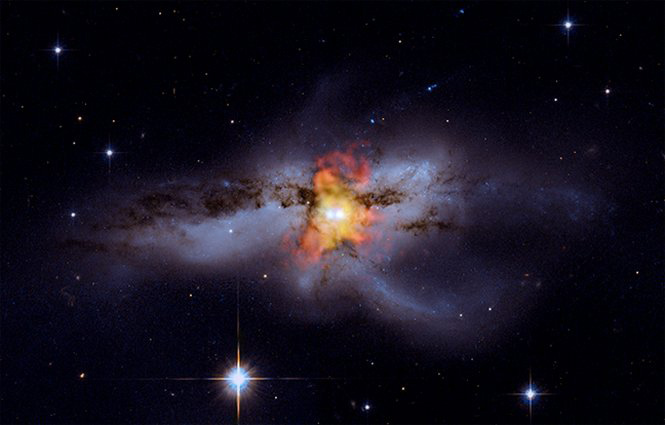 "Using gravitational waves as an observational tool, you could learn about the characteristics of the black holes that were emitting those waves billions of years ago, information such as their masses and mass ratios, and the way they formed" said co-author and PhD student Davide Gerosa, of Cambridge's Department of Applied Mathematics and Theoretical Physics. "That's important data for more fully understanding the evolution and nature of the universe." "The equations that we solved will help predict the characteristics of the gravitational waves that LIGO would expect to see from binary black hole mergers," said co-author Dr Ulrich Sperhake, who, along with Gerosa, is also a member of Cambridge's Centre for Theoretical Cosmology. "We're looking forward to comparing our solutions to the data that LIGO collects." "Like a spinning top, black hole binaries change their direction of rotation over time, a phenomenon known as procession," said Sperhake. "The behaviour of these black hole spins is a key part of understanding their evolution."